What’s completed; and Happy New Year! Well, it’s been a while since I’ve posted here. Yet another year sees me go into a sort of holiday hibernation at the end of October. Anyway, I’ve got a completion that I want to post up. I’ve also done some work on new models and moved toward completion of painting some other models. The latter I’ll save for another post. 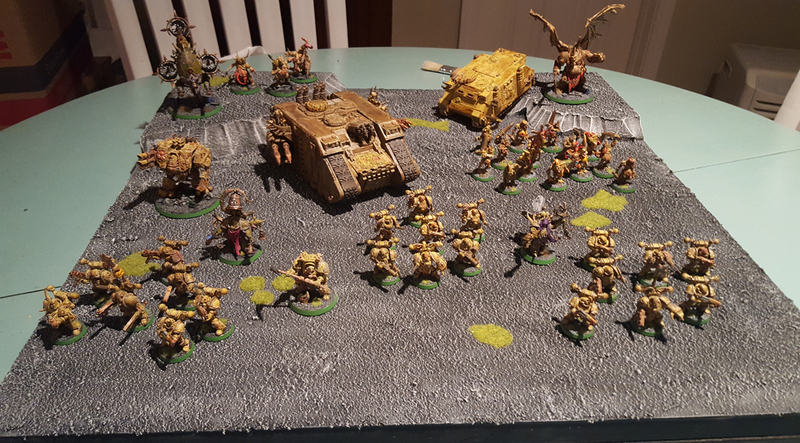 Here I’ll focus on the completed Armies on Parade board. As I said in my previous post, I’d received some peer pressure to do a board. Being this was my first time doing this event, I decided to stay conservative with the project. I also knew I wouldn’t have a whole lot of spare time. So with the board construction completed, it was time for painting. I wanted to use a scheme similar to the bases of my Death Guard models. It’s sort of an ash/gray waste scheme. I had several old bottles of Apple Barrel paint I used in painting scenery in previous years – and just happened to have Dark Gray, Light Gray and White. To my surprise, all the paints were in good working order and hadn’t separated in any way. 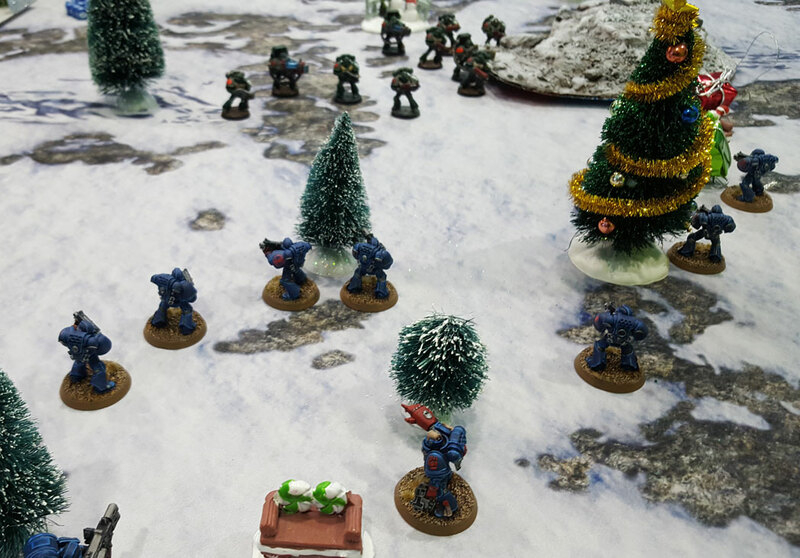 My opponent played a Harlequin troupe, though she had to use some Dark Angel proxies as she hadn’t brought her Eldar models. That was all fine and good with me. I’d not had a chance to play Kill Team yet, or really even look at the rules for it, so I was mainly interested in just getting my feet wet. I’m all for the heuristic gaming approach!